Can you show the equations, and how he used them to come up with a predicted position to within 1 degree of angle on the sky? Yes but that's pretty much just showing you the calculations but, whatever. in the case of the equation "ri" = the acceleration of Neptune and Uranus, "mj" is the mass of the objects and "G" is the gravity of Neptune pulling on Uranus, "ri" and "rj" where the positions of where the two planets were, "rij" is the distance from the sun (i) and every vector of the sun (j), he first started to simplify the equation to x, y, and z, variables, then, he used those as variables for the Sun, Uranus, and Neptune, and added the gravity, mass, and acceleration numbers to the bodies and he made his answer. (PS) He figured out all these thing by OBSERVING Uranus and that was half the battle. Indeed this is what I was thinking about. I like the historical explanation PropulsionDisk but to make a more in-depth discussion we should talk about the actual calculations. Source of the post And that's about it! Hope this answered your question FFT, and sorry if I missed some things, I was mainly trying to just get your question answered! And no, stating the universal law of gravitation is not actually what we are asking either. That is just part of the premise not the actual calculations. By the way I would like to point out some statements that I belief are erroneous here, in your historical summary. Just for any future reader to take these into account (don't hate me please). Source of the post THE FIRST THEORY OF NEPTUNE'S EXISTENSE WAS MADE BY GALILEO GALILEI, ON DECEMBER 28, 1612, PROBABLY ONE OF THE MOST WELL KNOWN ASTRONOMERS, WAS ONCE LOOKING AT THE NIGHT SKY, SEARCHING FOR NEW PLANETS. THAT NIGHT, HE FOUND SOMETHING VERY INTERESTING, IT WAS WHAT SEEMED TO BE A STAR THAT DIDN'T TWINKLE, AND THEREFORE GALLIEO THOUGHT HE HAD FOUND A PLANET! HE LOOKED AT AGAIN A YEAR LATER TO FIGURE OUT THAT IT WAS STARTING TO GO RETROGRADE AND THEN PROVED THAT IT WAS INDEED A PLANET, HE WROTE IT IN HIS DRAWINGS OF THE SOLAR SYSTEM WITH NO NAME AND SHOWED IT TO THE PUBLIC, ASTRONOMERS KEPT LOOKING FOR NEPTUNE AND EVENTUALLY FOUND OUT THAT IT WAS JUST A STAR THAT WAS IN CONJUCTION WITH JUPITER WITCH IS WHAT MADE IT LOOK LIKE IT WAS MOVING TO GALLIEO, AND HIS SMALL TELESCOPE, AND WAS NEVER FOUGHT OF AGAIN INTILL 1821. Galileo's notes never mention any "theory of a new planet". 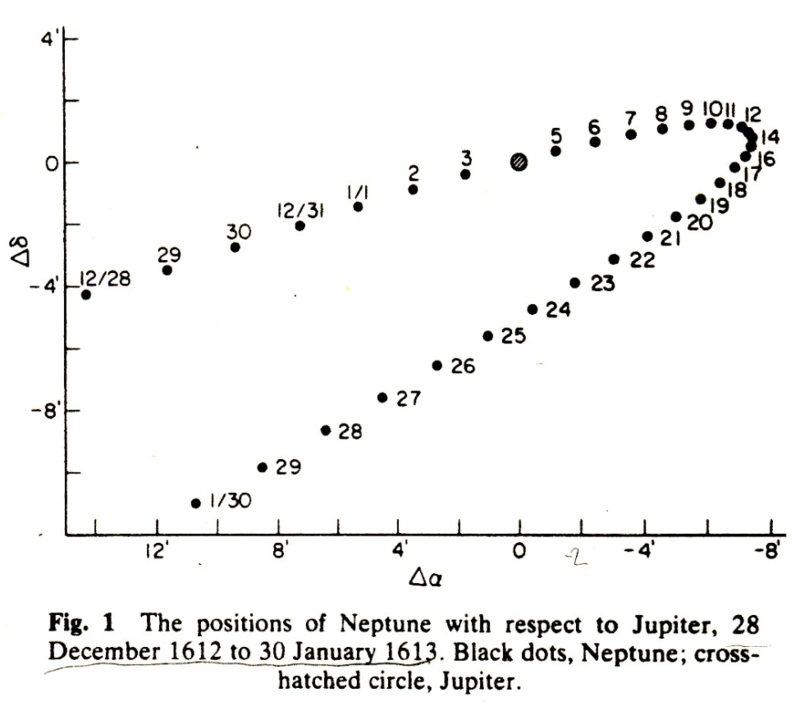 Galileo observed Neptune in two documented occasions and confused it with a star. He never mentioned this apparent star as possible planet. And that presumed star indeed turned out to be Neptune (so Galileo skipped Uranus, which was undiscovered, and saw the farthest known planet in the Solar System). The fact that Galileo noticed its movement is true but not as you explained. He named the "star" "fixa", as a fixed point of reference to understand Jupiter's motion, he never thought that this "fixa" could have moved just because the relative separation with Jupiter increased (this was expected and no confusion at all for Galileo). What he observed is that another star (HD 105374) was moving relative to this "fixa" and that was what in turn confused him since any two stars should have been at the same relative positions. 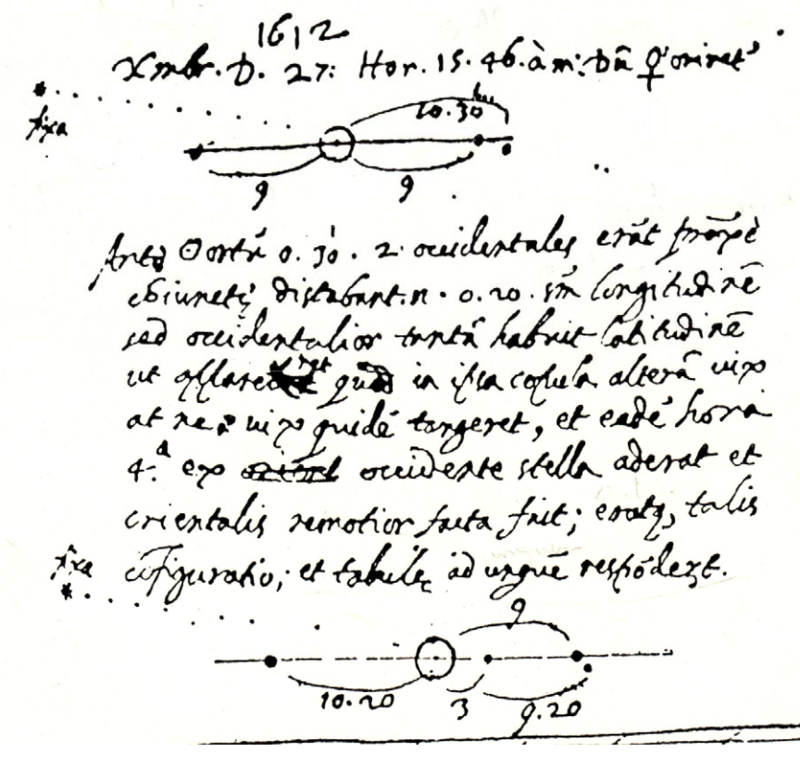 This discovery (of Galileo's observations) was published in Nature by Charles T. Kowal & Stillman Drake in 1980. The article is interesting on its own if anyone wants to research on the history of "the precovery of Neptune". It seems that Galileo pointed his telescope to Jupiter in a very appropriate moment; our current high-accuracy ephemerids show that Neptune was been occulted by Jupiter in January 1613 (a one in a century event at best). That means that the months before and after that event Neptune was close to Jupiter in the sky and any curious eye trying to learn something about Jupiter would have been able to possibly spot Neptune. The diagram above shows Jupiter and the relative postion of Neptune from 12/28 (December 28th) to 1/30 (January 30th). The second lucky thing is that Jupiter started in January 1613 it's retrogade motion (apparent from Earth). This is why in the diagram (where Jupiter is fixed) Neptune appears to return. The fact Neptune was slowing down and returning close to Jupiter's position is also good since that incremented the chances of Galileo to spot it. Galileo is known to have been able to spot even magnitude 9 stars. Since Neptune never gets above magnitude 8 that means that Galileo indeed should have been able to see Neptune in some observation that moth. The field in the sky where the first observation was made is depleted of bright stars so this "fixa" must have been Neptune indeed. 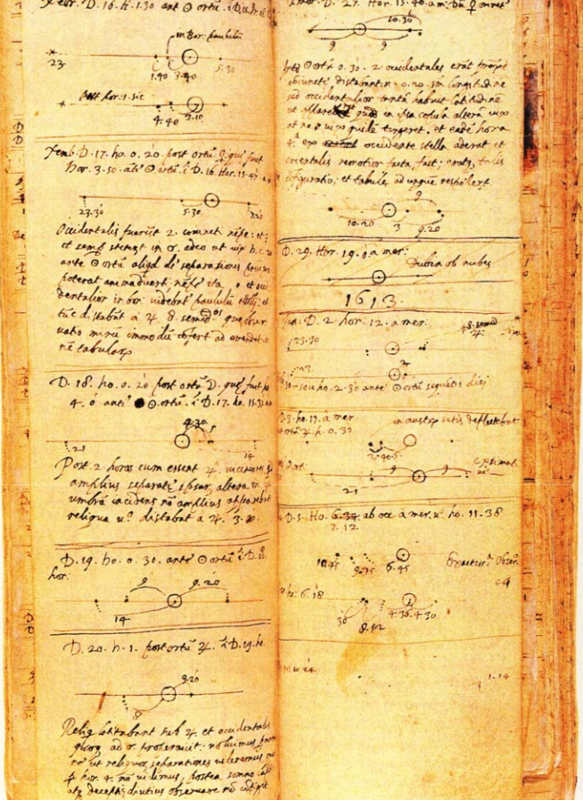 Let's look at the actual notes done by Galileo. In the upper part he writes the time when the observation was made. It is December 27th, 1612, 15 hours and 46 minutes after noon. Galileo's way of formating time seems strange to us now. 15 hours and 46 minutes after noon is just 03:46 am of the next day. So the observation was made at 03:46 local time in December 28th of 1612. The first drawing shows Jupiter and 3 moons aligned in the same plane, he also puts "distance" measurements between Jupiter and each moon; the one in the left was at 9 jupiter radii, and the two on the right where at 9 and 10,3 jupiter radii respectively. He wrote "fixa" for a star in the upper left part of the image which he would take as a fixed point during this set of Jupiter observations. The lower drawing shows the situation a few hours after that. The moons have moved a little (one of the four moons has just started to emerge from the glare of Jupiter's disk) and "fixa" still remains more or less fixed in place. As you can see "fixa" must be the planet Neptune and not a star. The moons marked by Galileo in the first drawing are (from left to right) Ganymede, Europa and Callisto. 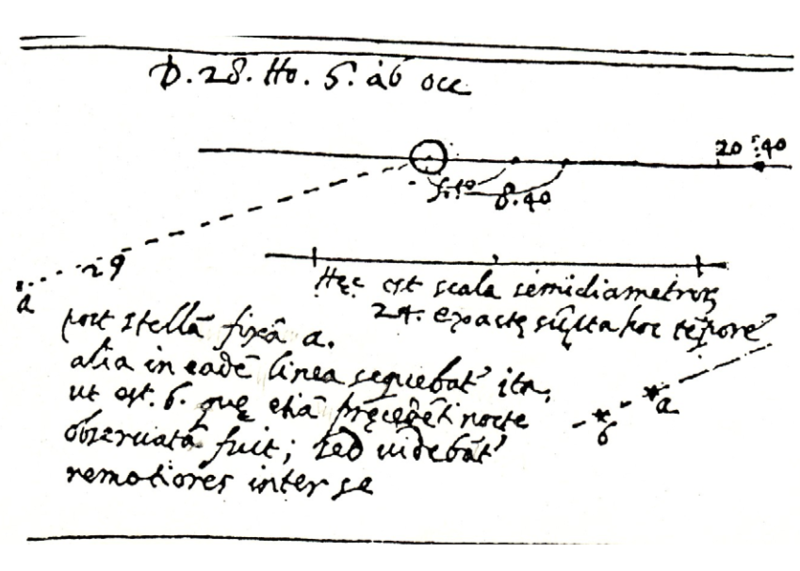 The interesting thing here is that in this observation Galileo wrote that "b", which was also observed in the preceeding night, and "a" seemed to be more remote from each other (inter se) than the previous night. This means Galileo was able to correctly detect the motion of Neptune, even if he dismissed the idea and never thought of it again. I want to emphasize "correctly detected" because he was aware that Jupiter and "b" would be moving relative to one another but the fact that "b" separated from "a" (both supposedly fixed celestial marks) was really unexpected. This is not entirely correct either. Le Verrier predicted the mass and orbital parameters of the planet (aswell as the current position) so he had a very good estimate as to how massive and far away Neptune was. That said it is true that semi-major axis and mass were educated guesstimates. By the way it is also worth noting that Adams is currently disregarded as a contributing force for the discovery of Neptune. Nearly all the credit goes to Urbain Le Verrier. Chauvinism and english nationalism ended in an embarrassing situation where the brits just evaded to show any calculations and even traveled with Adams documents across the world just to make sure no-one ever read them and maintain their prestige. Propulsion Disk, what I'm getting at is if he simply observed Uranus for a few months and tried to observe how much it got pulled by Neptune during that time, then the effect is too small to be detected with the telescopes available in the 1800s. Let's plug in the numbers. Neptune has a mass of M=1.02x1026 kg. Let the observing time be 6 months. Then the shift in Uranus' position due to Neptune pulling on it during those 6 months, assuming they were only 10AU apart, is 370km. From our vantage point about 20AU away, this can produce, at most, an angular shift of 0.025 arcsec. So in the 19th century, no telescope in the world could possibly hope to see Uranus be perturbed by Neptune over the course of a few months. There has to be more to the explanation of how Neptune's influence was observable. In fact, there is. 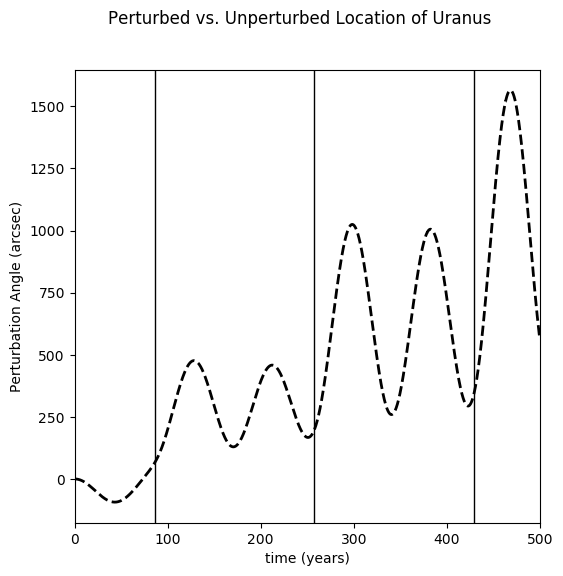 Try checking the wikipedia article on Neptune's discovery for more information on the perturbations. Edit: Oops, I got ninja'd! Amazing stuff, FFT. I love the historical documentation. Yeah sorry about that guys, it didn't turn out nearly like I wanted it to. but I tried. No worries! Like FFT said I thought your historical background was well done. I think the way to look at this is that it is like doing a small research project. These are complicated subjects, and it takes quite a bit of work to understand and present them. And just like in academics, at the end of any presentation there is a Q&A where people can ask questions. Maybe something is unclear, or maybe someone is curious about more details. Going through all of this can be tough, indeed, but it's also a great learning experience for everyone! I applaud your effort! Source of the post No worries! Like FFT said I thought your historical background was well done. Source of the post I think the way to look at this is that it is like doing a small research project. These are complicated subjects, and it takes quite a bit of work to understand and present them. And just like in academics, at the end of any presentation there is a Q&A where people can ask questions. Maybe something is unclear, or maybe someone is curious about more details. Going through all of this can be tough, indeed, but it's also a great learning experience for everyone! I applaud your effort! Source of the post He did? Where? Maybe I didn't emphasized that sufficiently. Source of the post So in the 19th century, no telescope in the world could possibly hope to see Uranus be perturbed by Neptune over the course of a few months. That's actually quite interesting and I didn't realized at all how minuscule the effect should be. Even with a simple model you have show how tiny this is. As I see, in reality it would be even worse since that acceleration could be archived only for short periods of time. After and before the actual opposition, Neptune would be farther away and we know that gravitational force is fairly sensitive to distance. Also in the opposition of Uranus and Neptune there is no place on Earth's orbit to have a reasonable angle to actually see the displacement (produced when the perturbing influence is at max). Since there's no situation where Earth could be perpendicular to the line between Uranus and Neptune (at their closest aproach) the angle subtended by Earth's orbit at Uranus distance has to be taken into account. I've calculated the real displacement to be around 0.052 times the one calculated by Watsisname when we incorporate this to the model. So instead of 370 km of displacement, from the best vantage point in Earth's orbit, we would at most see 19 km!! Even with current technology it would be nearly impossible to notice at all (if we had 19 km resolution we would be mapping Uranu's moons from Earth). First: a larger observational baseline is needed (not just a few months). Second: Neptune's tug, even if weaker, should be more constant and oriented tangential to Uranu's orbit when they are still far from opposition. The first thing is easy. Le Verrier used only observations made between 1781 and 1821. That's 40 years of observations. Let's take 8 years for example as a baseline. Uranus and Neptune are close to their opposition all this time so we can still use the aproximation of the gravitational tug staying constant. The good thing of the formulas provided by Watsisname is that time is squared so if we increase a little the observational baseline we have a significant increase in the effect. In this case and even considering my 0,052 factor we get 0,34 arcseconds of separation between the real Uranus and the "predicted" Uranus after 8 years. Barely noticiable still. So the actual perturbing effect is, maybe (I don't know so please tell me if you have better insights) due to the second option. 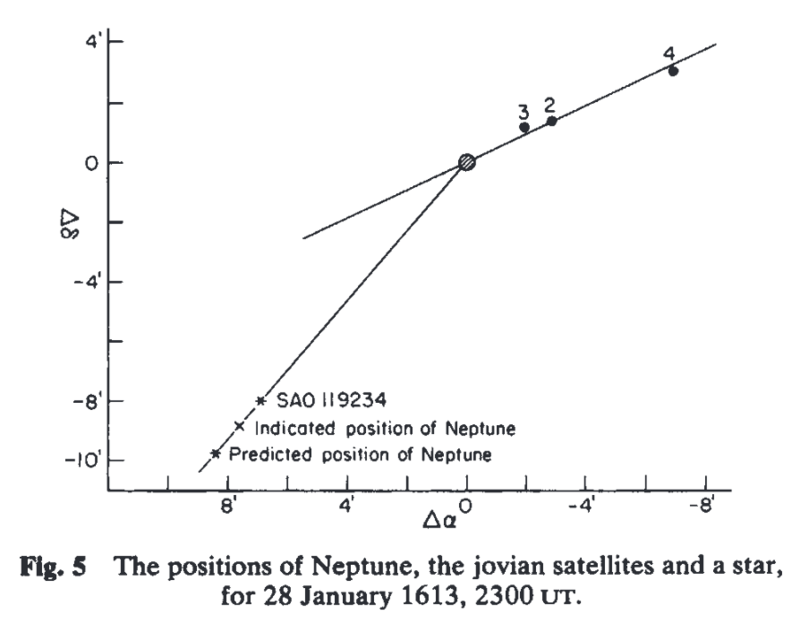 The actual configuration where the Sun-Uranus-Neptune angle is 90º (in this configurations Neptune's tug is directed tangentially to Uranu's orbit) was archived around the year 1800 and again around 1850 (in the middle there was the opposition). In this configuration Uranus and Neptune were separated by a distance of r= 25,4 AU. But also in this configuration we (the Earth) can be at a good angle to see Uranu's displacement (perpendicular to the Neptune-Uranus line if you want), so here there's no need for my 5,2% reduction of the effect. You can admire the 100% of the displacement in this configuration. The problem is that the tug is weaker since Uranus and Neptune are farther appart than when they are at opposition. But still considering just 6 years it would mean a 0,59 arcseconds discrepancy (surpassing 1 arcsecond after 8 years only), something that starts to be noticiable I guess. Here we have a graph (taken from Le Verrier: Magnificent and Detestable Astronomer) that shows the "residuals" of Uranu's longitude across 150 years or so. O stands for the observed longitude of Uranus and C stands for the computed longitude of Uranus after taking into account the perturbations of all the planets. If there was no Neptune this should have been a straight horizontal line at 0 arcseconds, since the computed position of Uranus and the observed one should agree, so the residual (which is the diference between both values) should be zero. But Neptune exists and the residual fluctuates. So lets compare both images. Around 1800 and 1850 we have the configuration I mentioned (where Neptune's gravitational pull seems to be tangent to Uranu's orbit). Around 1820 we have the opposition. As you can see Uranu's predicted position is lagging behind with respect to Uranu's actual position because Neptune is accelerating Uranus along his track (his orbit). The opposite can be seen in 1850 when the predicted position of Uranus is ahead of the actual position (because Neptune is pulling Uranus in the opposite way so it decellerates). 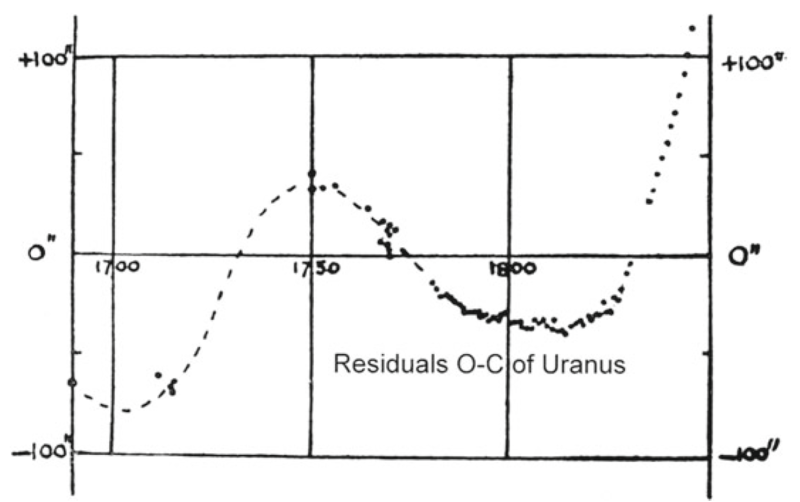 This is also evident in the residuals graph; in 1800 the computed longitude for Uranus was larger than the observed one so the residuals where negative, but close to 1850 the residuals are positive since the observed longitude is larger than the computed one. Also interesting to note the fact that at opposition the effect is the lowest possible, even if paradoxically the gravitational tug is the greatest, because of the proyection effect of the acceleration I've talked about in my second statement. You can see that the residuals disappear at opposition and Uranu's position does not differ from the predicted one (also, bare in mind that the separation in the second image is greatly exagerated to make it clearer). But I still miss a more in depth explanation. I've shown that in 1800 and 1850 the effect is more noticiable than in 1820 when the planets are closest to each other. But still we get around 1 arcsecond displacements after 8 years. Too little in my opinion. Also in the residuals graph they are using one or two orders of magnitude above that (tens or even near a thousand arcseconds discrepancy) for the residuals so probably I am completly lost in terms of what the residuals actualy are and how they are actualy calculated here. I can only make little sense of the overall trend in the different years. Also I can't understand why the graph of the residuals behaves like that, it seems to increase a lot when the planets are farther apart for some reason and it is not sinusoidal as I intuitively expected. Also the graph seems to indicate that the zero point for the residuals (where the difference between observation and prediction is zero because the prediction was made from this moment) was taken around 1775, right? Why? And why it is so close to the expected time on which Uranus and Neptune should be the farthest appart possible? Coincidence? Those are the kind of things that make me think that I haven't understanded the basics of the ideas behind the discovery. I would like to know more. a lot more. It would be crude but beautifull to see the full demonstration just to feel the power of Newtonian vision. But sadly this is a difficult topic. Jean-Babtiste Biot attempted to explain Le Verrier's methods in six papers he published in 1846 (just before the discovery) and in the third paper he wrote "As I progress in the task I have undertaken, the difficulty of the subject seems to increase". I feel the same. The more you know the more complex it seems to be. I hope there's someone here that has the patience to explain it in detail because it is very exciting subject in my opinion and there should be some place on the internet that has an explanation like that. Source of the post Second: Neptune's tug, even if weaker, should be more constant and oriented tangential to Uranu's orbit when they are still far from opposition. Yes, I think this must explain the majority of it. Although as you point out, it also seems like the more deeply we investigate how this works, the more complicated it gets. The information you pulled up is extremely interesting and also helps illustrate the complexity of the problem. Science and astronomy were surprisingly advanced in those days, without the benefit of computers! One thing what I really want to know about celestial mechanics, is how transit timing variation method works. I mean in details: equations, and how they are linked to transiting exoplanets observation data processing. 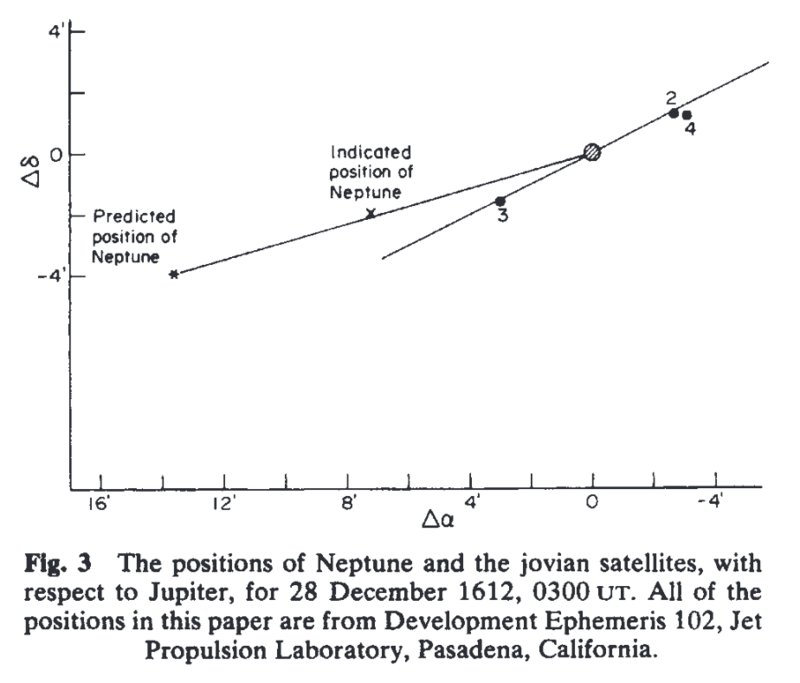 May it be similar to the method used by Le Verrier to predict Neptune's position? 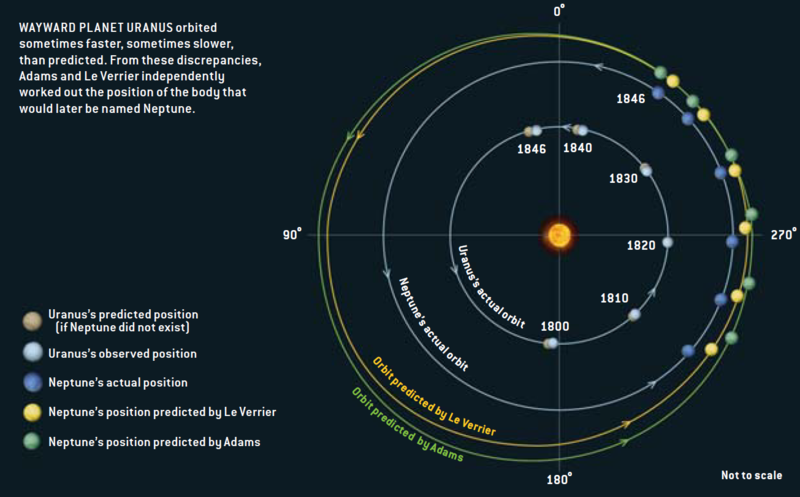 If not, can we use the "Le Verrier method" to predict new planets in extrasolar systems? There are a bunch of systems where known planets displays unaccounted TTV. BTW, this forum supporst Latex formulae. BB-code is TEX, and there is a button on the toolbar which links to the online editor. Source of the post But sadly this is a difficult topic. Jean-Babtiste Biot attempted to explain Le Verrier's methods in six papers he published in 1846 (just before the discovery) and in the third paper he wrote "As I progress in the task I have undertaken, the difficulty of the subject seems to increase". I feel the same. The more you know the more complex it seems to be. I hope there's someone here that has the patience to explain it in detail because it is very exciting subject in my opinion and there should be some place on the internet that has an explanation like that. I feel the opposite! The picture you provided explains the physics. If Neptune would be discovered today, I would just generate 1000 simulated Neptune orbits, integrate Uranus and Neptune motion, and compare with observations to choose the best matched one. Computer is the most powerful scientific tool today!. But obviously this were not be possible in XIX century, so Le Verrier and Adams used completely analytical methods. I suppose they used some simplifications, for example, neglect mutual inclinations of Uranus and Neptune (assumed their orbits co-planar). Source of the post If Neptune would be discovered today, I would just generate 1000 simulated Neptune orbits, integrate Uranus and Neptune motion, and compare with observations to choose the best matched one. Computer is the most powerful scientific tool today!. There are still significant differences between them (like the amplitude, and width of the minimum vs. maximum), which I guess is mostly due to Uranus' eccentricity. I must factor that in to 'perturbation simulator v0.2'. 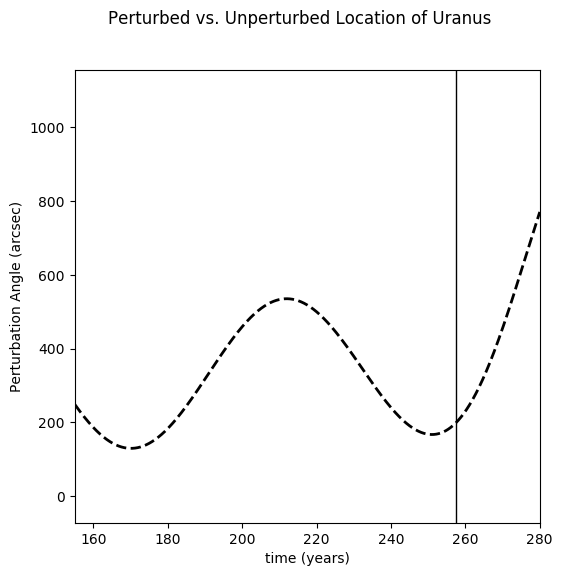 The shape and overall trend of the curve also depends a lot on the initial position of Uranus relative to Neptune. I have no idea what Le Verrier used in detail. But any rate I think the physics operating here is pretty clear like you said. The variation occurs because while Uranus is approaching Neptune, Neptune causes it to accelerate, and then decelerate after closest approach. It's a very slow effect since the gravitational attraction is weak when they're far apart, but it has a lot of time to accumulate. I think this is also exactly the explanation behind exoplanet transit timing variations. We see the projection of the planet in its orbit against its star, so these same perturbations will cause transits to appear earlier or later than they otherwise would if there were not additional planets in the system. I'm not sure of the exact details for how we go from the timing observations to predicting where the other planets are, but it must be essentially the same problem, solvable by computer with Monte Carlo methods. I'm still very curious in how exactly they solved Neptune's orbit without computers. For a computer this is a problem that takes a few seconds. But by hand...? I can't even imagine. Plus they were observing the effect, and had to deduce the cause, by successively adjusting the "guess" for the location of Neptune to get closer and closer to what was observed. This is more in the realm of "mathematical methods of physics", but a very interesting subject. Source of the post Is the Moon more strongly atracted to the Sun than to Earth? Reading this question, I though that the obvious answer is no. Moon should be more attracted to Earth, since it orbits it, instead of the Sun. So I checked the gravitational force calculator. Moon is attracted to Earth with the force of 178 142 946 TN when in apogee and to the Sun by 435 641 781 TN of force at the distance of 1 AU. So... is the answer yes and the Moon is attracted to the Sun about 2.5 times more than to the Earth? How does it stay on orbit around Earth? Either I made a typo or something in the calculation or I do not comprehend the problem in sufficient depth. Source of the post Reading this question, I though that the obvious answer is no. Moon should be more attracted to Earth, since it orbits it, instead of the Sun. Your calculations are correct! If were able to hold in place, with our "god-like hands", the Earth, the Sun and the Moon during a solar eclipse (so that the Moon is between the Sun and the Earth) the Moon wouldn't fall on Earth but on the Sun instead (but if we let not only the Moon free but also the Earth, the Moon and the Earth would collide before both crash into the Sun). Strange thing then to think of the Moon orbiting the Earth right? I've dropped that tricky question because I wanted to show how the very well known basics of how newtonian mechanics works is not so easy and no so basic when you realise certain counter-intuitive things. I will try to adres this topic in the future (I'm currently searching for a concise and clear explanation so I don't generate more confusion, so if anyone wants to give it a try is completely welcome to do so). The idea has to do with how the Hill Sphere (the sphere of gravitational stable influence of Earth) is defined. This topic is introductory to that concept in my opinion so I sorted it like that. My idea to gain intuition first here (in principle) is to note the fact that when viewed from an heliocentric reference frame (a "more inertial one" compared to that of Earth) the path the Moon follows is not at all a loop of loops (as one imagines) but it looks more like an heliocentric orbit that cappens to be accompanied by a perturbing body called Earth that generate little oscillations in that quasi-keplerian orbit around the Sun. The next part has to do with a more in depth understanding of the difference between the gravitational potential and the generalized potential from a non-inertial reference frame. Something that Watsisname has somehow started in his post about the relativistics effects in Mercury's orbit. I will get into there but bare I would love to here some explanation from some of you on this topic since I thing this is the kind of problem that can be adressed in very diverse (but equivalent) perspectives, with varied examples (and I'm still searching for the good ones, so help me). So I checked the gravitational force calculator. Moon is attracted to Earth with the force of 178 142 946 TN when in apogee and to the Sun by 435 641 781 TN of force at the distance of 1 AU. So... is the answer yes and the Moon is attracted to the Sun about 2.5 times more than to the Earth? OK OKAYY! now this is something I HAVE to see! someone PLEASE try to make an explanation for this in here, this has gotten me very VERY interested! I look forward to this post, FFT! Not only is it true that the Moon is more strongly attracted to the Sun than to Earth, it is even possible for an object to orbit around... something that has no mass at all! (Here, there be dragons Lagrange Points). This might be a perfect followup from the Hill Sphere discussion later on.